Tested and works great! Batteries included. Vtech Computer Pal In Concert. Encourages children to learn about music in a fun way. Very Rare HTF. In excellent clean working condition. Bugsby pen requires button batteries. Disney Junior Miles From Tomorrowland - WORKS WITH INNOTAB MAX, INNOTV, AND INNOTAB. Explore outer space with Miles and the rest of the Callisto family! Marvel Ultimate Spiderman - Works with all InnoTab Systems. Disney - Jake Neverland Pirates -Works with InnoTab systems except InnoTab MAX. Nickelodeon Teenage Mutant Ninja Turtles Turtle Power! -Works with InnoTab systems except InnoTab MAX. Disney PIXAR - Pixar Play -Works with all InnoTab systems. 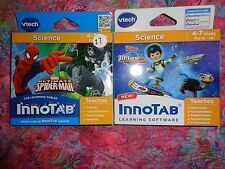 Lot of 2 V tech Interactive reading system, V.Reader "Dora the Explorer" Dora and the 3 little Pigs and Disney's Tangled in new/sealed condition. Disney Tangled. Disney Monsters University. Hello Kitty. The VTech Learning App Download Card allows you to get more content for your child's favorite VTech toys. 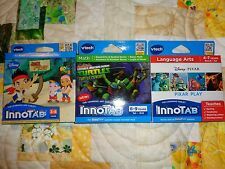 With the VTech Learning App Download Card, you can give your child more content for their InnoTab, MobiGo, or V.Reader. Includes the following 20 activities: Spelling, Plurals, Word Guess, Word Scramble, Synonyms, Correct the Word, Complete the Word, Antonyms, Add it, Subtract it, Odds and Evens, Quick Equation, Find the Sign, Next Number, Roman Numberals, Music Box, Follow the Note, Piano, Pattern Match, Pairing Cards. Toy is in good to very good pre-owned condition and working order - may show normal wear for age and use. •Good condition. All The Ones That Have Lights And Sounds Work. •Good For Learning,Motor Function,Shapes,Colors And More. Scratches from use, works great! May need a little wiped down. Uses 4 AA batteries (not included). SKUNK / BIRD / FROG. MINT / NEAR MINT / NEAR MINT / EXCELLENT / VERY GOOD / GOOD. BASIC GRADING SCALE. Nickelodeon Teenage Mutant Ninja Turtles Turtle Power! - Works with InnoTab systems except InnoTab MAX. Marvel Ultimate Spiderman - Works with all InnoTab Systems. Help the Turtles try and thwart Shredder's evil plan. Doc Mcstuffins - Creativity. - Ninja Turtles - Math. SET OF 3 Vtech Toy Cars Battery Operated Fire Trucks & Helicopter WoW! Disney - DoC McStuffins. Disney PIXAR - Pixar Play (ages 4-7) Language Arts. Photo Fun - Take photos with your favorite Pixar characters! Spelling - Find the missing letters to help Buzz defeat Zurg! Kids can read along with an adventure story featuring Dora, Boots and all their friends. A pop-up dictionary features kid-friendly definitions of words found in the story to help build vocabulary. Pop-up dictionary uses animated definitions to teach new vocabulary in a fun way. Join Doc McStuffins and her toy friends as they decorate the backyard! You can also help Doc give the toys a check-up and read an e-Book story about helping Robot Play. Dora the Explorer - Let's Help! Used but in great condition, tested, includes box, type pad and booklet, does NOT include casette. These all have been tested and work great. Clean and smoke free. This is for the following cards: 2-5, 8-10, 12-26, 28-41 and 48. I believe that is 37 cards in all. BOX SAYS "TALKING PHRASES INSTRUCT, ENCOURAGE AND GIVE PLAYER'S SCORE. TWO LEVELS OF DIFFICULTY WITH 1 AND 2 PLAYER MODES. FUN FOR THE WHOLE FAMILY. FOR AGES 8 AND UP, GRADES 2 AND UP. REQUIRES 4 "C" BATTERIES OR 9V ADAPTOR, NOT INCLUDED. Disney - PIXAR - Pixar Play (ages 4-7 Pre-K-1st). Explore outer space with Miles and the rest of the Callisto family! Disney Junior Miles From Tomorrowland - (ages 4-7 - Pre-K-1st). Your friendly neighborhood Spider-Man is now the Ultimate Spider-man! Brand New from 1986 Learning Window teaching machine, comes with box and manuals .. The box has a dent in the cardboard on top . 100% Authentic and from K-Mart ..